Planner Rose Muema holds a Bachelor of Arts in Government and Geography University of Nairobi and Master of Arts in Urban and Regional Planning from the same university. Rose is a public policy and Urban development expert with a professional background in Urban and Regional planning. She has over 25 years work experience accumulated in urban planning and development management environment. Rose is a registered Physical Planner with the Physical Planners Registration Board and a corporate member of the Kenya Institute of Planners. She held senior positions of responsibility in both National and County governments involving research and policy works, programming, projects implementation, resource mobilization, and environmental protection among others. Some of the works involved collaborative programs, projects and policy works with international partners across the world with exposure to international best practices. 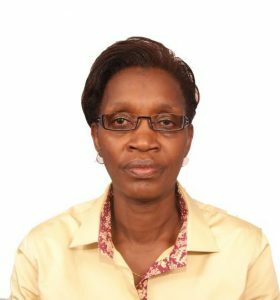 Rose later joined the private sector where she provides consultancy services in areas of planning, urban development, infrastructure and environment. She brings into the board her public and private sector experiences and an asset in international best practices in matters planning and urban development. Planner Rose is the Board Vice-Chairperson and a member of Projects, Town Planning and Markets committee; and member of the Environment, Water, Sanitation and Social Services committee. Copyright © 2019 Government of Makueni County. All rights reserved.